Today’s projects were all part of this month’s Team Swaps – I love the variety of projects that my team always shares and so I wanted to share them with you too! 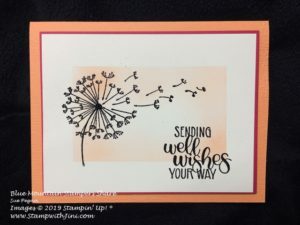 This first one uses the Tea Together stamp set (148779), Rectangle Stitched Framelits Dies (148551) that you can find in the Occasions Catalog along with our Tufted Embossing Folder (146335). 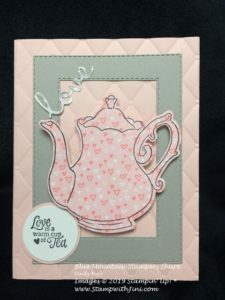 If you love this card you’ll be happy to know if you didn’t get the coordinating Tea Time Framelits Dies for FREE during Sale-a-bration, they will be available again in June since they are part of the 2019 Annual Catalog. So you can get the set now and start stamping and then get the dies later! And do you recognize where the word love is from? 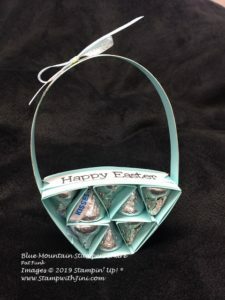 It’s from our Well Written Framelits Dies (148534) If you haven’t seen this bundle of products found on page 27 of the Occasions Catalog you’ll want to check it out. It’s a wonderful set of sentiments and dies that make up endless options. along with the Subtle Embossing Folder (143706) – if you don’t have this folder you’ll want it since it adds just a touch of texture to any project! The pop of Lovely Lipstick matting this focal point is lovely with the Grapefruit Grove. A combination I wouldn’t have thought of. And how about this fun Cross Over Gate Fold Butterfly Gala (148580) card? And now for the 3d projects – I always love the fact we can create great little gifts like these with paper and ink! 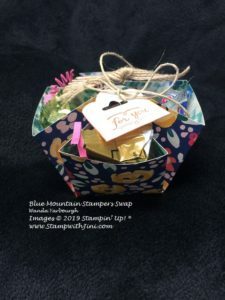 If you are looking for a great group to craft with and share my team the Blue Mountain Stampers may be the right place for you. We love welcoming new crafters, you can click HERE for more information about joining. And of course I’m happy to answer any questions you may have too! Speaking of my Team, stop back by tomorrow when I’ll be sharing some of the projects I’m making for our OnStage event in Charlotte. The Annual Catalog is right around the corner and I won’t be able to mail you one if you have chosen no contact. 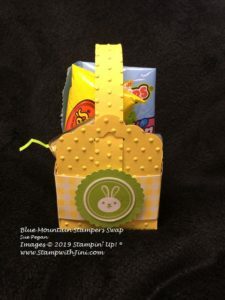 Are you eligible for a FREE Stampin’ Up! 2019 Annual Catalog? Are you a frequent customer of mine? 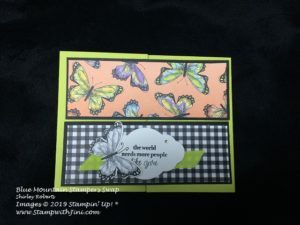 If you ordered a minimum of $50 from me in the last three months (or 90 days) you are eligible to receive FREE Stampin’ Up! Catalogs. Have you hosted a Private Party? 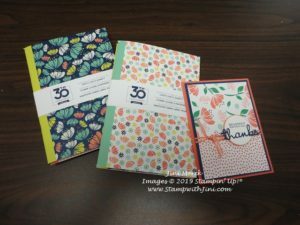 If you have gathered with friends in the last 3 months (or 30 days) you are eligible to receive FREE Stampin’ Up! Catalogs. Haven’t ordered from me for awhile or are new? Place an $50 order with me during April and you are eligible to receive FREE Stampin’ Up! Catalogs. (If you are placing an Online Order make sure your information is up to date and correct). Today’s project is a thank you card that I designed to to go with a small gift as a little thank you for those customers that helped me reach my $100,000 in sales. I whipped up a quick tutorial so that you can make some too. 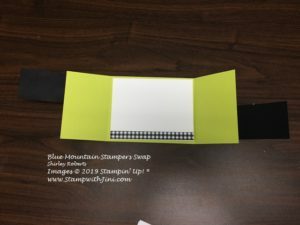 I used the Happiness Blooms Designer Series Paper for this project since it coordinated with the note books. I just love the bright, bold, and cheerful colors used in this pack of paper.